This is a copy of a page from http://www.peterverdonedesigns.com/05shock.htm . The stock rear shocks on Honda's latest high end sport bikes are superb. They are so nice that I will be tuning mine rather than buy an aftermarket unit at this point. The spring and parts to do this cost less than $150. compared to over $1000 for an Öhlins or Penske. All I loose is ride height adjustability. We will see how important this turns out to be once the bike has been set up. I had an adapter ring made so that I could mount a Hypercoil spring to the stock rear shock. It is well worth it as now the stock shock is up to snuff. 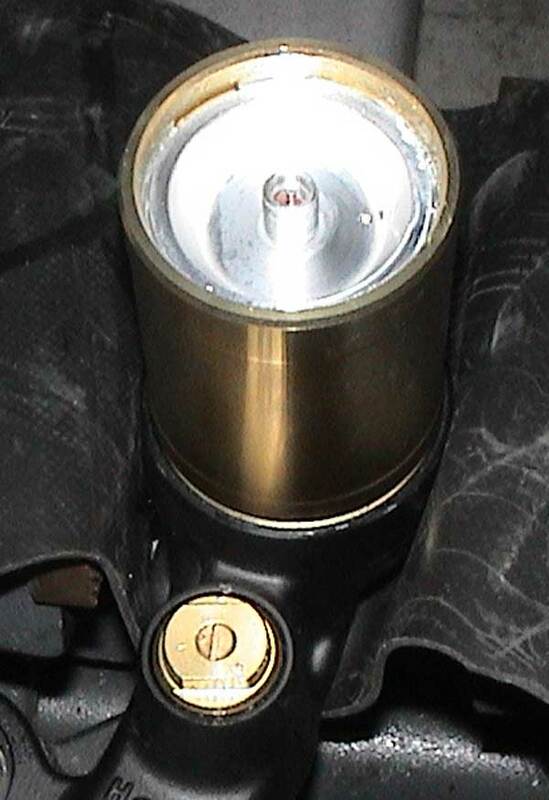 The aluminum adjustment ring seat on the shock also needed to be reduced from 2.380" to 2.250" to fit within the spring properly. 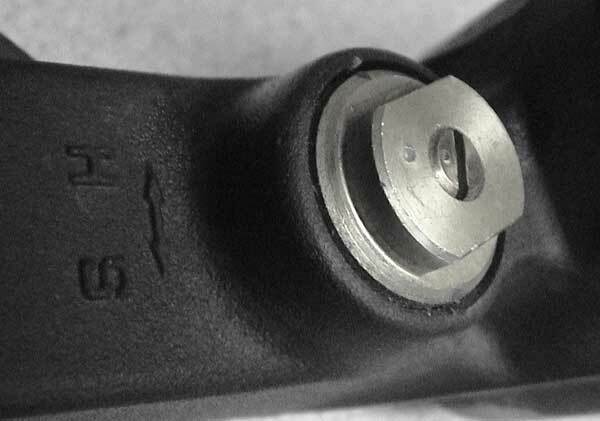 The stock spring is 185mm long, has a rate of approximately 550 lb/in, and is preloaded 15mm in position #1. The stock shock is MEE-A01 and measures 310mm eye to eye. 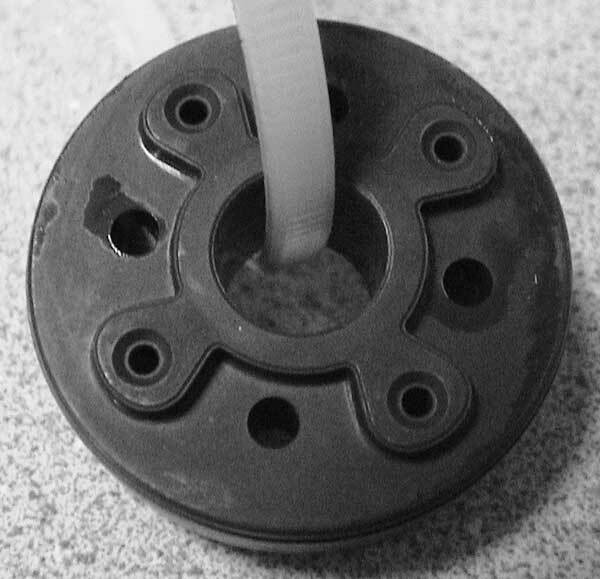 The preload mechanism moves 10mm in 10 steps. At first I ran a 7" 630 lb/in (Labled 650, 3% off) 2.25" Hypercoil spring with 10mm of preload in position #8. I was able to get sag numbers of 5/free and 33/rider. The 686 lb/in (labeled 700) spring that I first put in the rear is perfect for 2 people, but too harsh for a single rider. Recently, I changed to a 600 lb/in spring preloaded to position #10 to give a little more comfort on the street. The wheel feels far more planted now as well. Now that I got the spring worked out, I can start working on getting the damping right. I needed to baseline the oil so I changed out the stock oil with 100% Red Line Extra Light (Blue) (cSt 9.8). Spring and damper, know the difference. Preload is for changes geometry, Spring is for changes in load, and the damper is for changes in velocity. It really is that simple. 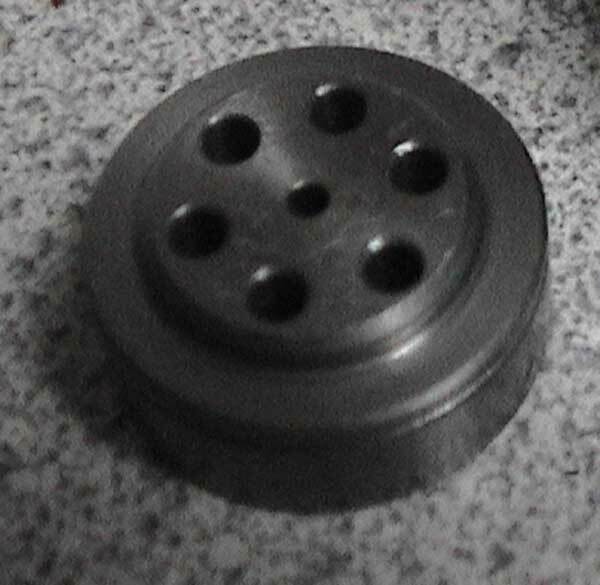 The air valve is under the tamper cap. Drill a 1/4" hole about 1/2" off center. 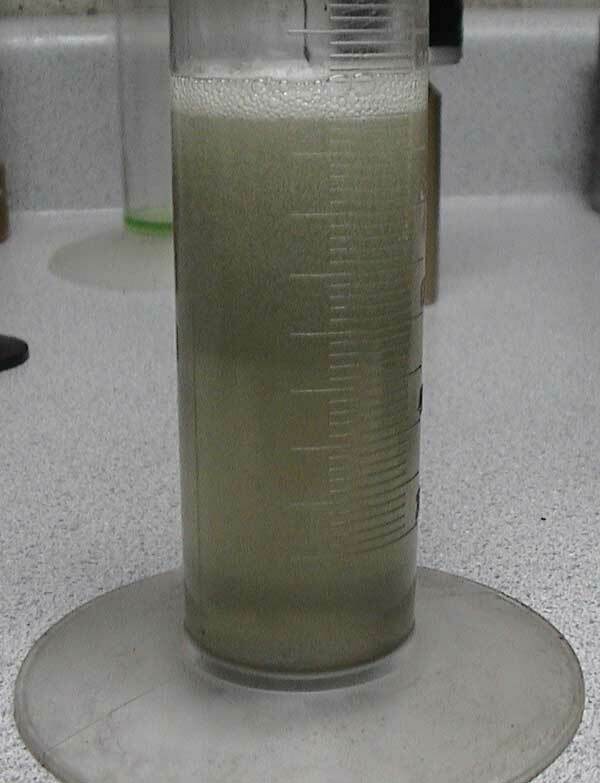 Stock nitrogen pressure is 150 lbs. This is a bit high. Explanation in a few steps. 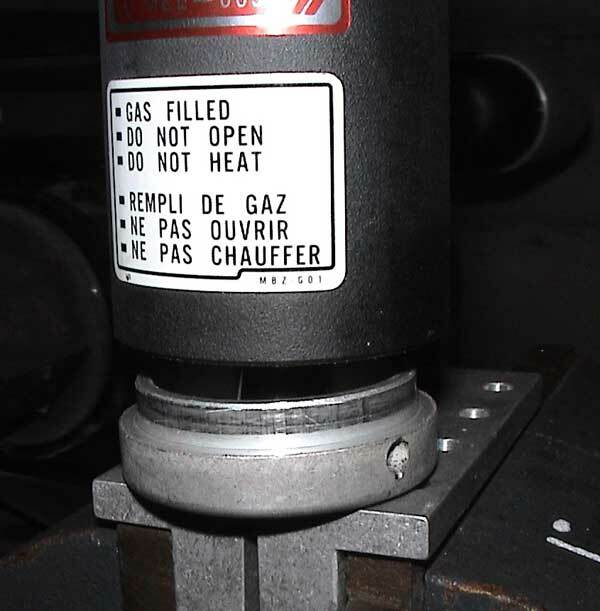 Push the cap in a little and pop the snap ring off. Pull the bladder out of the canister. This is the stock oil. I ended up collecting about 170 ml of this crap. Take a look at the massive amounts of foaming in this oil. This leads to cavitation. 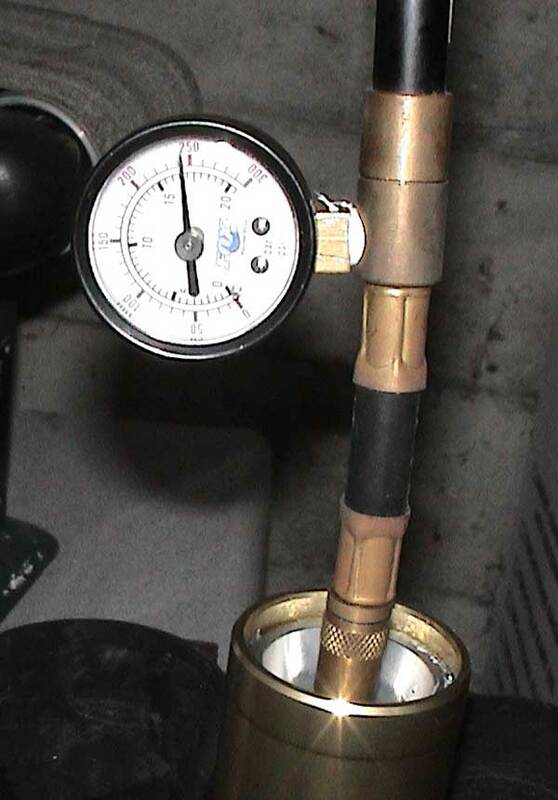 Air pressure is used to counter cavitation. That is why the pressure was so high. I will end up putting about 100-150 psi in the shock. The valve should be polished and ported. Original condition is on the right. I also changed the compression stack to match the heavier spring. It needs to be lightened up. The new compression stack. A little better. Still needs some work. Fill it up and bleed the shock fully. 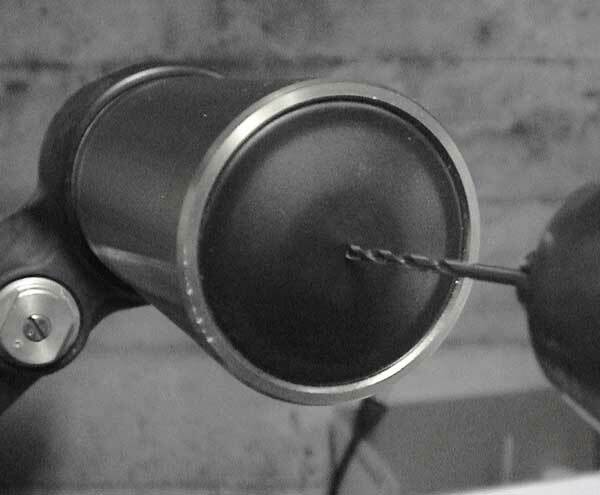 Getting the bladder back in the canister requires removing the valve core until the bladder is mostly inside, then putting the core back in and giving it 1-2 psi to maintain shape. 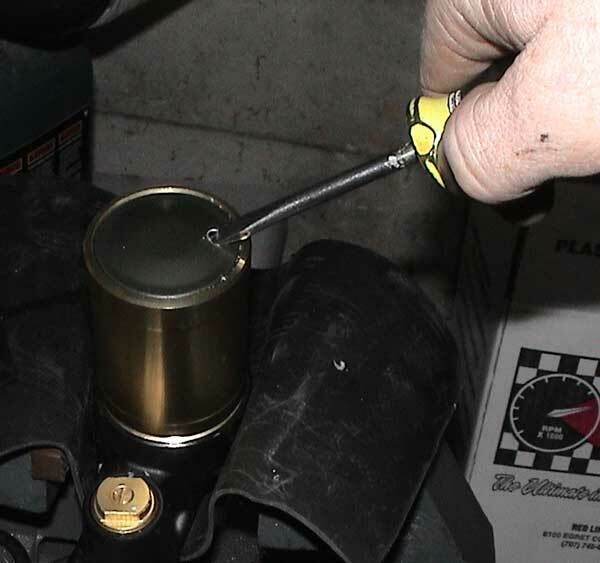 Charge the shock with about 250psi of nitrogen and Install a steel valve cap over the valve to make it look like you know what you are doing. 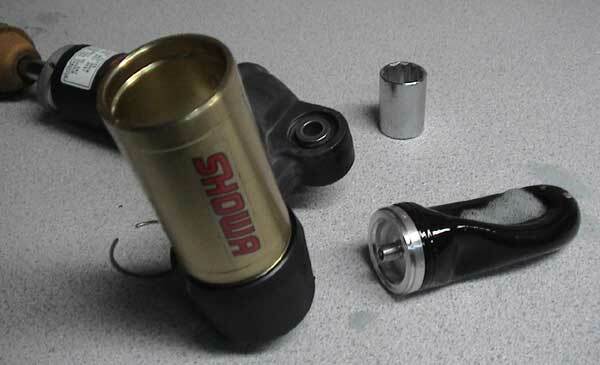 This is the process for disassembling a 2003 Honda CBR600RR rear shock. 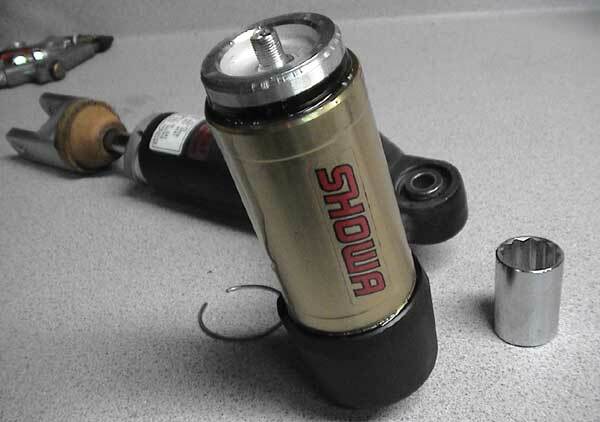 The part number labeled on this shock is Showa MEE-003. 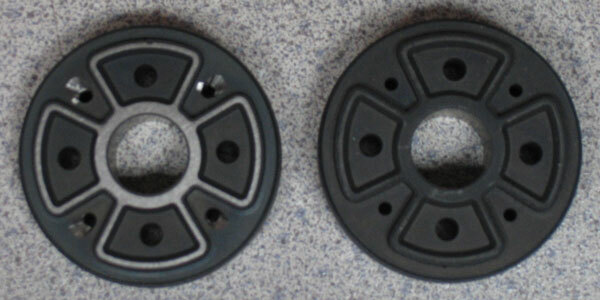 Aside from the exterior, most modern Honda shocks use the the same type of internals. 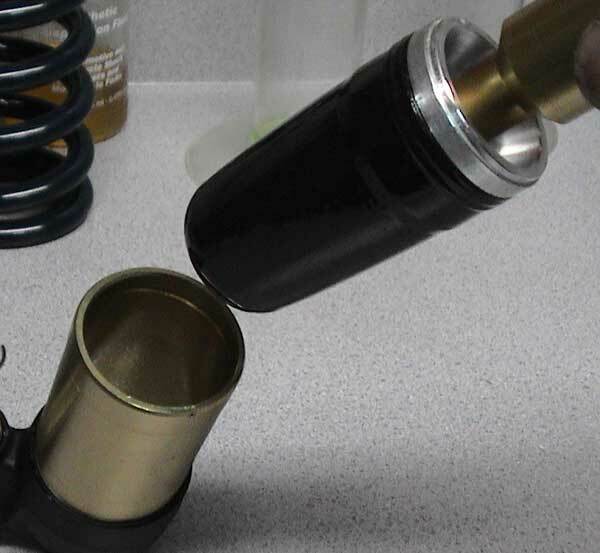 This one has two stage valve stacks on the piston, which is very nice, but you can do that to any shock if you want. The quality of construction in this shock is very, very good. The F4i shock that i had worked on in the past was not quite as nice, but this one is top notch and is actually worth working on. Figured I'd rate the stock yellow shock spring first. The spring is not very linear, but could loosely be called a 600 lb/in spring. Free length 6.91" (175mm). OD on side 1 - 3.25", OD on side 2 - 3". This tapered spring in biggest hate on Hondas. 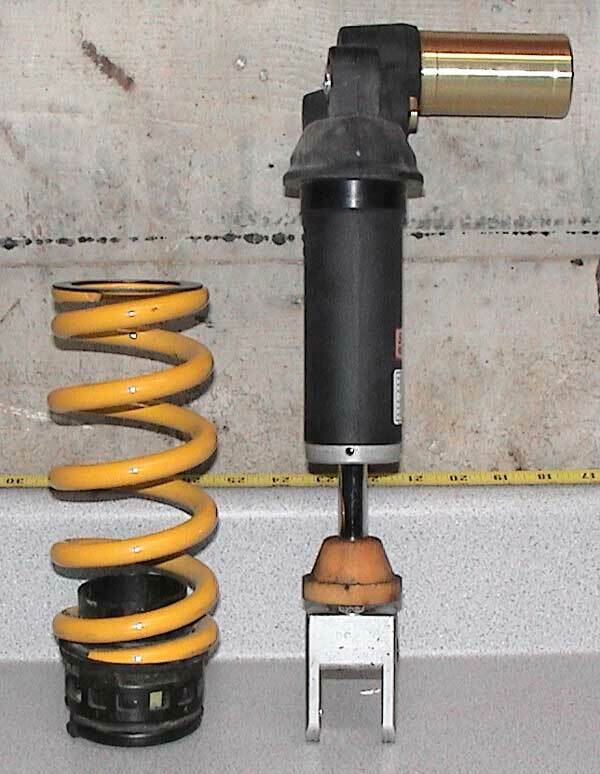 If the spring was straight, we could swaps springs very cheaply and make stock shocks work perfect. damn. 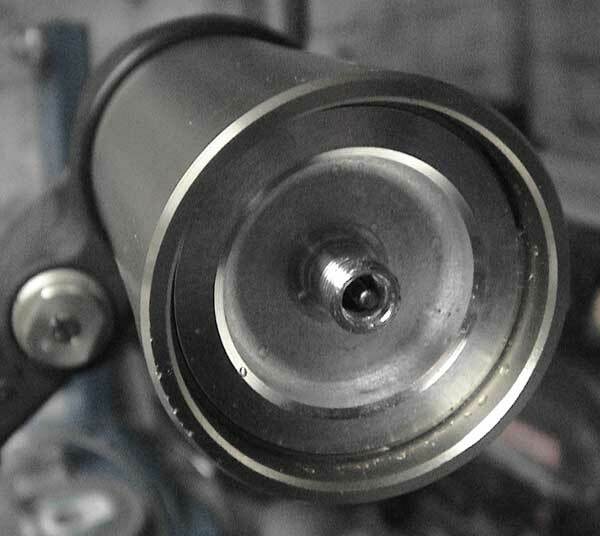 Machining is in order to make an adapter. Below is what I had made for about $60. 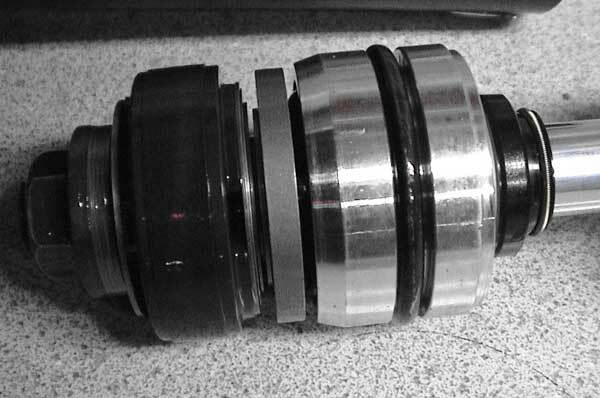 It is a pretty simple part, anyone with a lathe could make one. I had this one done in steel since I wanted to keep the stack size to a minimum. If you have the room, aluminum would be much better. This will allow me to use a quality hypercoil spring that cost me about $75 each. I just checked with Racetech, they carry springs made by Eibach that will work for these bikes. 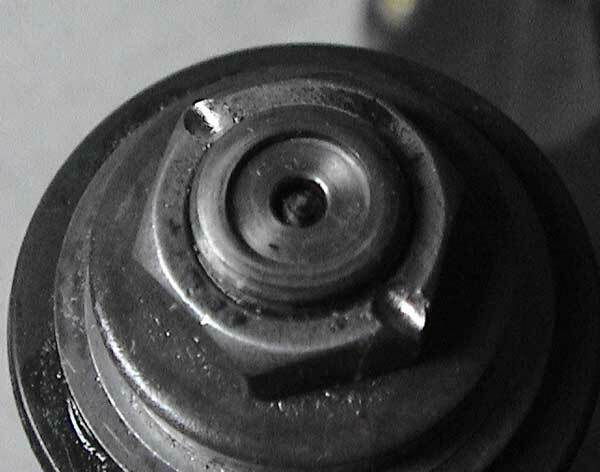 Supposed to be a drop in replacement (tapered spring). One of the part numbers for this springs is #SESPS700225. I believe that this is for a 700 lb/in (12.5 kg/mm) spring. The cost is a bit, $120 per spring. They should have springs from 250-800 lb/in. I think that it is better to pay a machinist so that you can use the quality Hyperco spring that costs much less and has universal use, than to pay twice as much for a goofy spring that is probably not even rated properly. 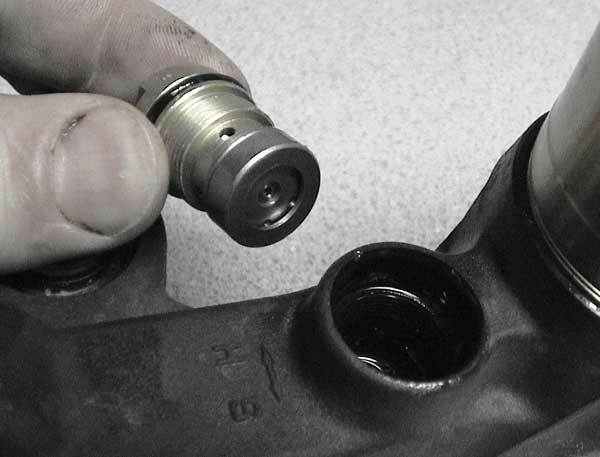 The preload adjuster moves 10mm in 7 steps. So that is actually pretty good. 1.43 mm each step. I take back what I had said before about the adjuster being too crude. It is actually quite handy provided you are within range. In position number 1, the spring measures 162mm. This means that preload goes from 13mm to 23mm. A pretty acceptable range. 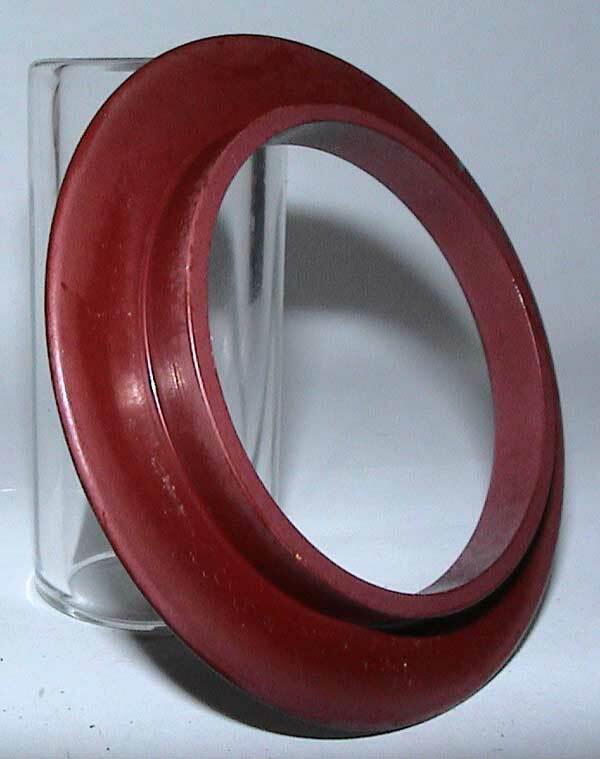 By swapping this spring with a 7" (178mm) spring, this range will go to 16mm to 26mm. That is a lot of preload to start, but I will see if it works. Otherwise, I'll make another adapter for a properly loaded 6" spring. Hyperco, of course! 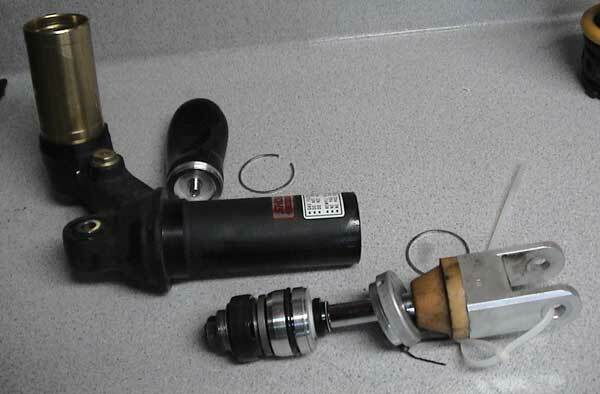 An interesting note: The Honda preload system appeared to me to be the same for the two shock that I had recently taken apart, 2001 CBR600F4i and 2003 CBR600RR. Upon closer examination, they were different in only two ways. 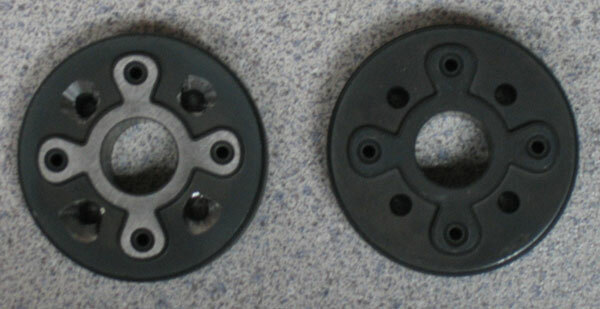 The split ring locators were 90 degrees rotated and more importantly the effective height of the mechanism was different. 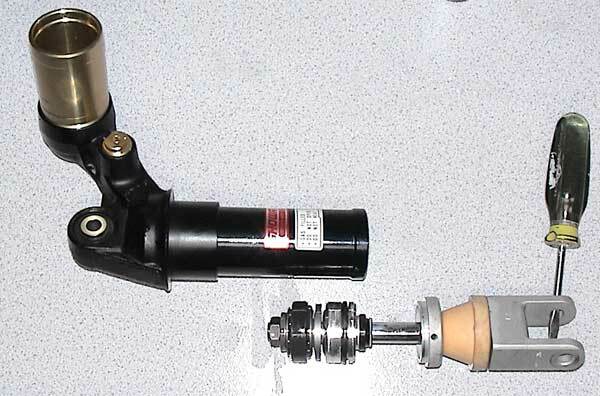 The 600RR mechanism measures 42.75mm and the 600F4i measures 46.50mm over the shaft base. 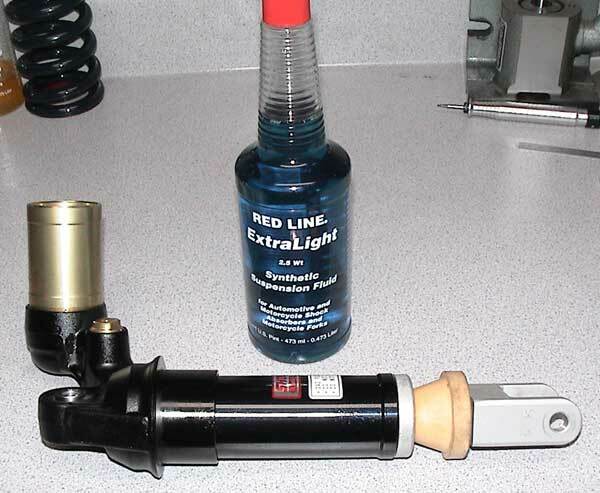 This may help the budget tuner get internal preload sorted just by scavenging other OEM parts. Use the holes to drive the end shield off. Aiming the punch at a downward angle works better than the approch as shown. The shield will drop away. 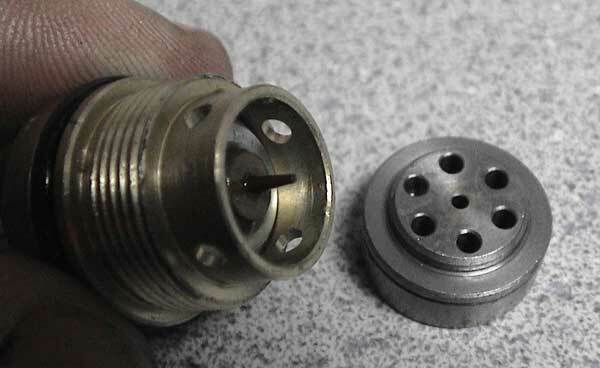 Actual cap and seal are underneath. Gotta get the shield cap off the canister. 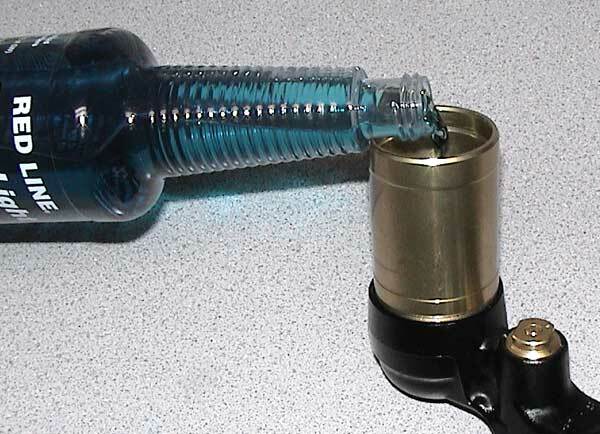 use a small drill to pop a tiny hole in the cap. You will throw this cap away, so don't worry about it. Make sure to drill about 0.625" off center unlike I am about to do. 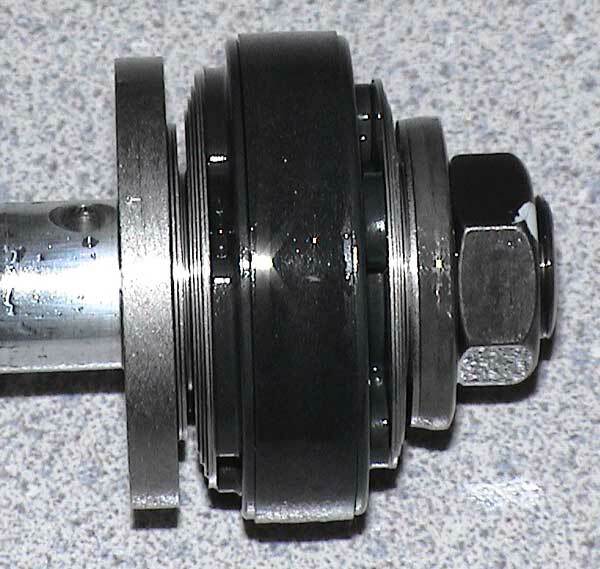 The nitrogen valve is under the center. My drill went in and tapped the valve. The sudden release of 150 psi sent this cap off like a bullet. *** Warning*** Do not point the cap at anything of value when you do this. It could pop off like a gun if the pressure releases. 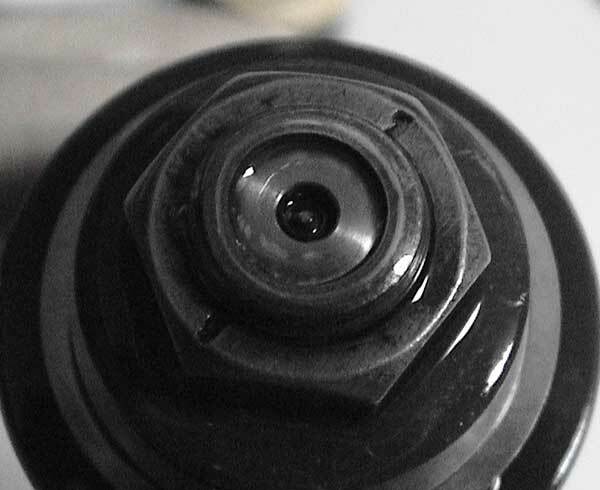 Push the true end cap in a little to get the snap ring out. 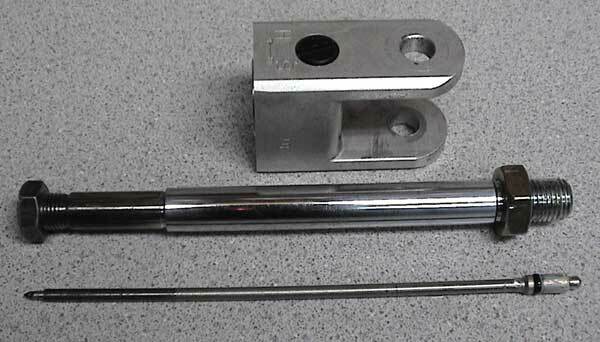 Use a socket of special tool in a large vise. Be sure not to gouge up the shock. You want it to look pretty when you are done. 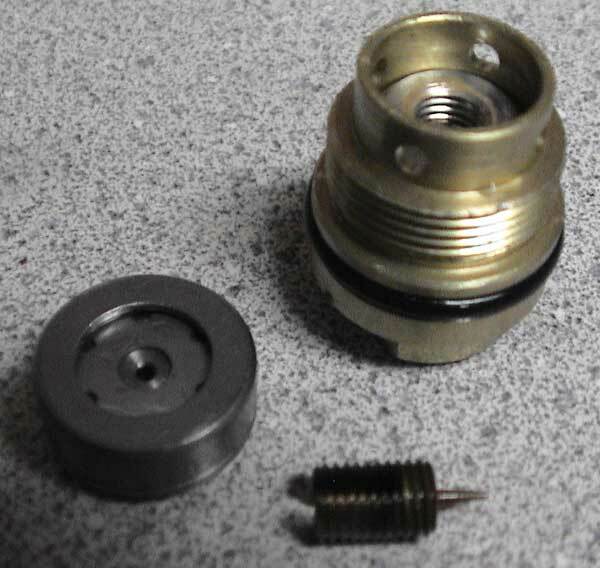 The bladder and cap. Decarbon shock at its best. Expanding bladder or floating piston, arguments can be made for either. I like the bladder better. It does not have the friction of the floading piston. Bladders can leak if not cared for. Be careful. 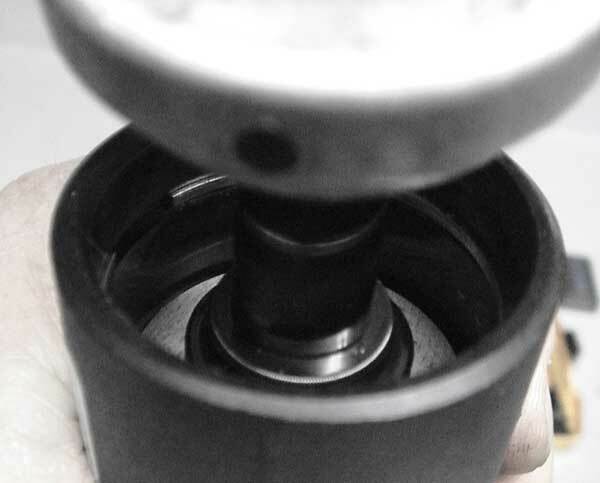 You have go give the shaft side a solid yank to get it past the snap ring groove. Quick and solid is the way to do it. Do not pry it free. You may damage a seal. The guts. 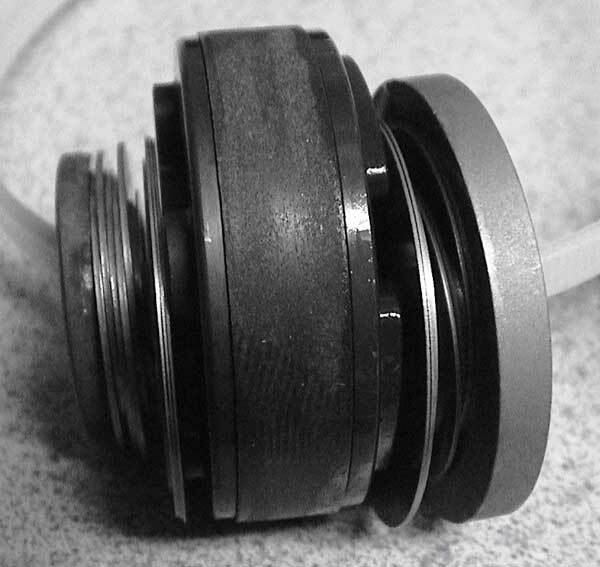 Shims, piston, seal, bearing. The rebound bleed is not visable in this shot. 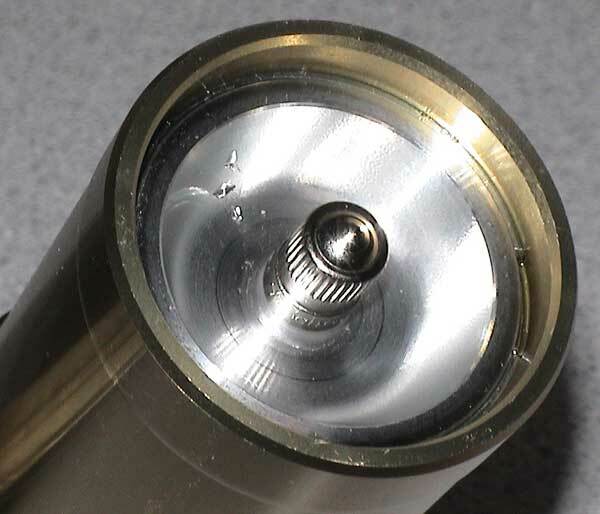 The nut on the end of the shaft is peaned at two places. You have to do something about this to get the nut off. Do not attempt to force it yet. 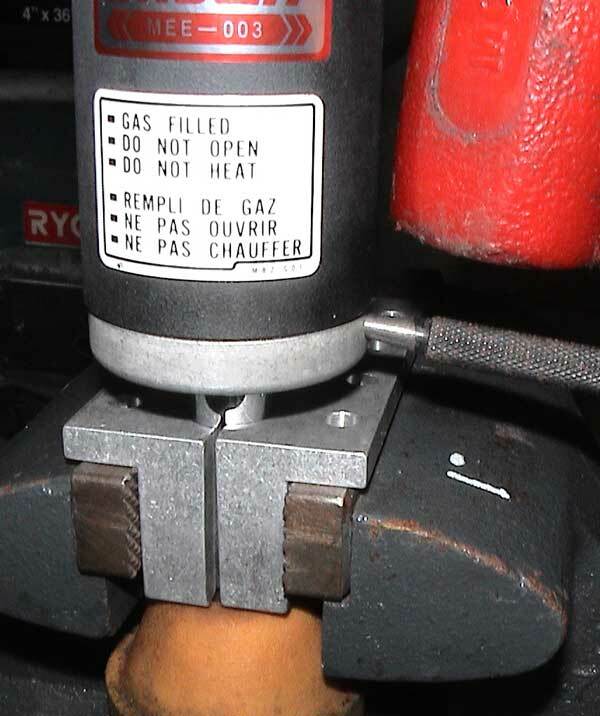 Use a die grinder or dremell to grind down the peen area. try not to grind the shaft threads. 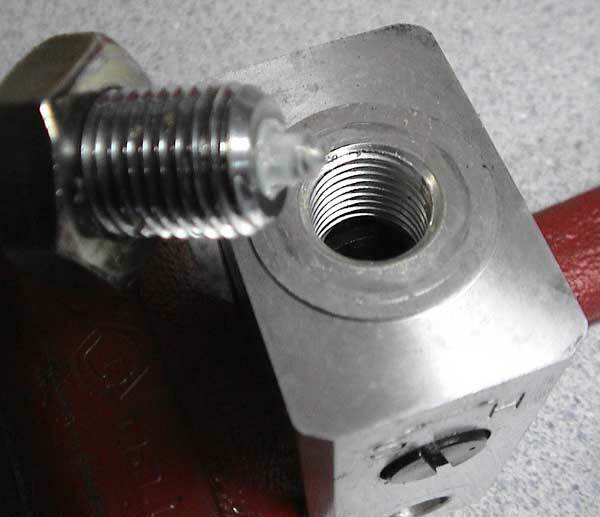 Use a little heat on the nut and a pin through the clevis (to keep the shaft from spinning). Now it is time to force it. 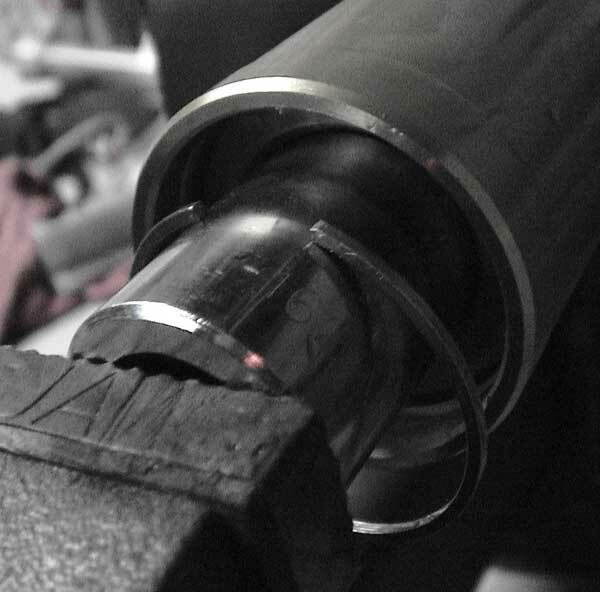 Racetech has a special set of soft jaws for vises that will help you hold the shaft while you work on this. Make sure not to mare the shaft. It must remain polished and free of burrs or dings. Rebound side. Lots of room to play with this valve. Let the dremells begin. 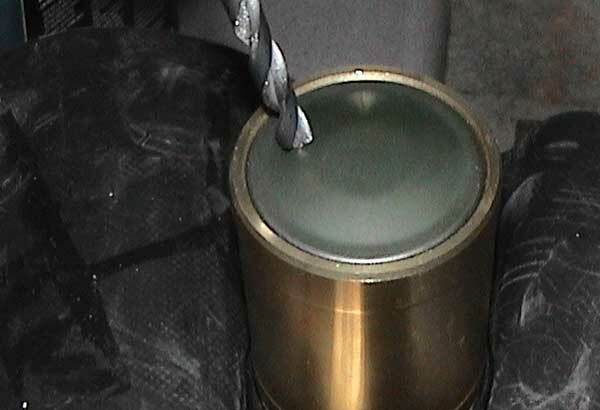 You want to reshape the fluid entry to the port similar to a velocity stack on a intake system. 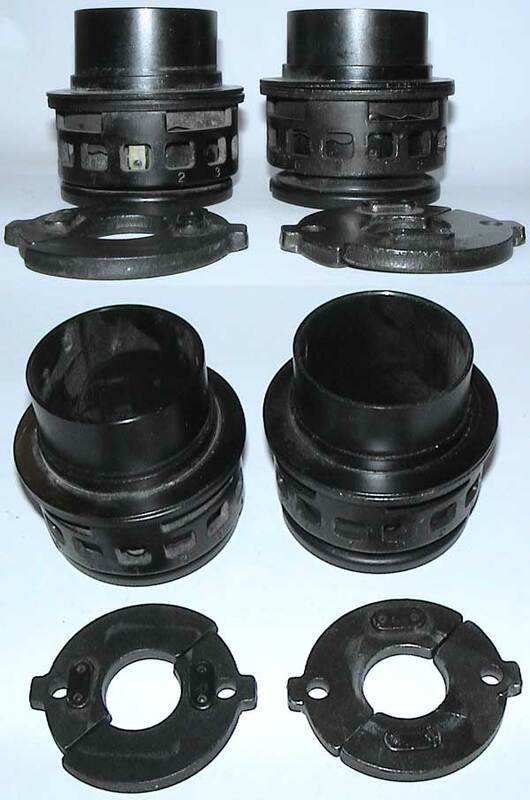 These stock pistons offer lots of room to reshape or report as you like. very nice. The compression side. Again lots of room to make this valve do what you want. The shims. Note the two stage stacking on both sides. It comes out in this nifty cartridge. I was so impressed by this piece. 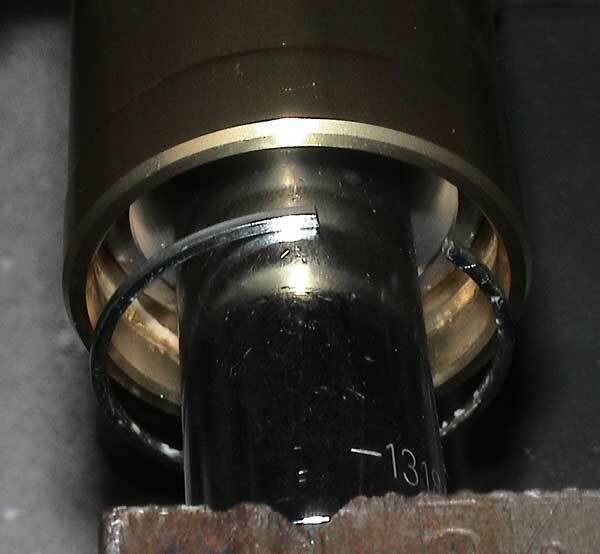 It is probably the single coolest thing about this shock. The needle and the orifice. That is a nice needle. I wish that they used a parabolic shape, but it is still very good. Note the front side of the unit. Very interesting. 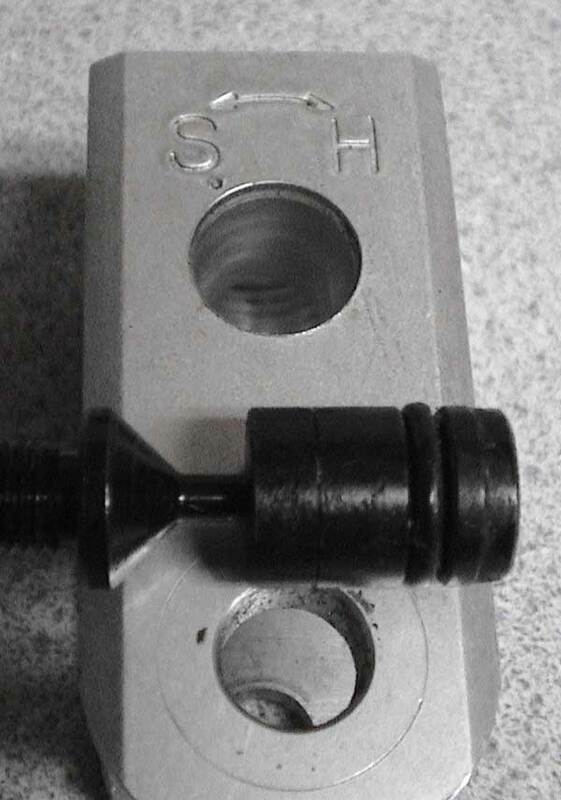 To get the slow speed rebound parts out, you have to remove the shaft from the clevis. 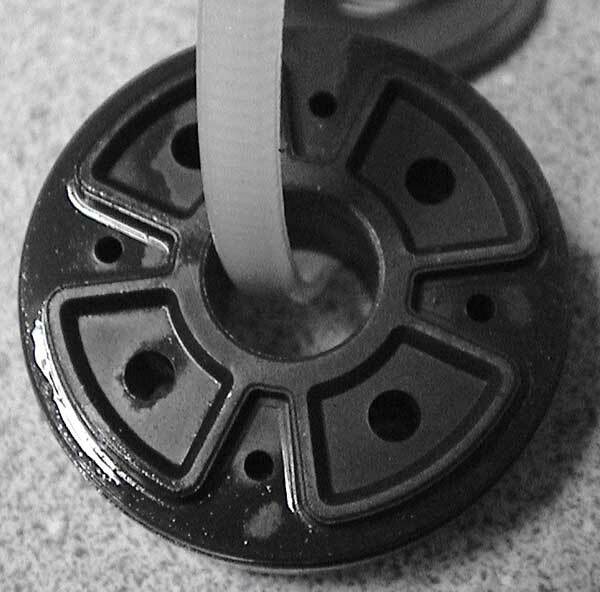 It is a double lock nut configuration. They were nice enough to grease the works for us. Fluid does not get in here. The needle is the taper at the very left end. 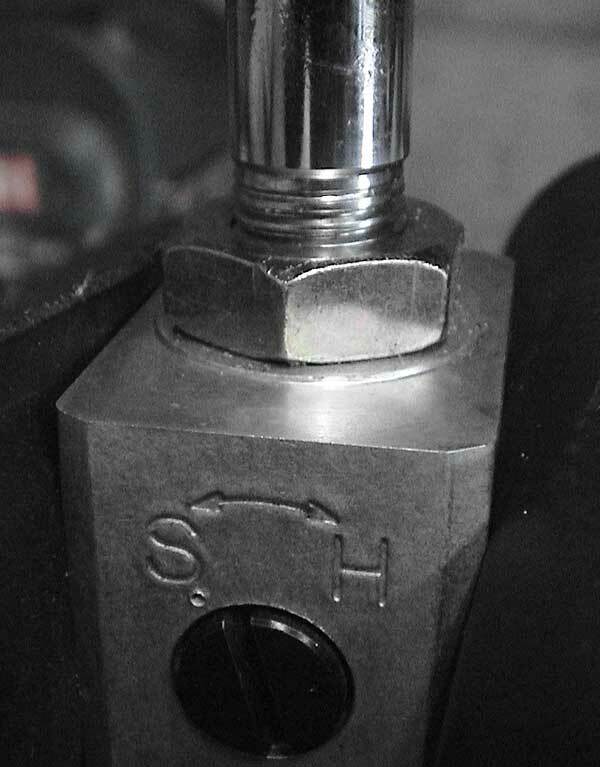 Replacing the clevis here will change ride height / shock length. The rod rides up the ramp to make the adjustment. 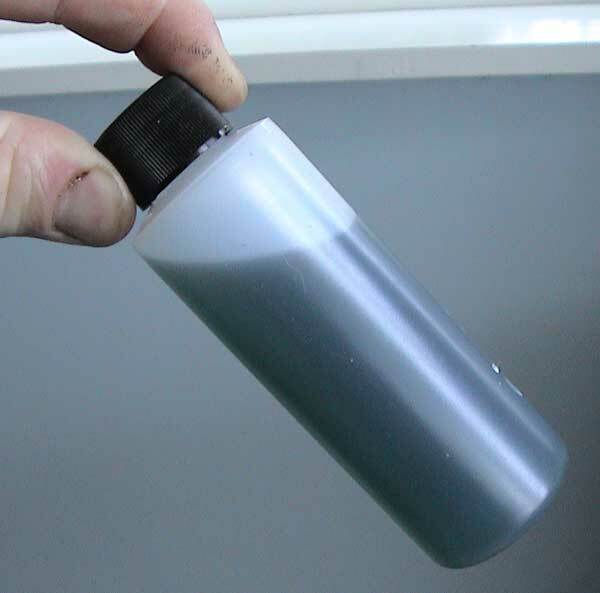 I took a sample of the OE shock fluid. It was very clean and looked to be in good shape. Very light blue in color. I'm not sure what oil it is, but it might be Showa SS-25, 12.50 cSt@40, 239 VI. Not positive. Copyright © 2004 DENOONserviceprovider. All rights reserved.